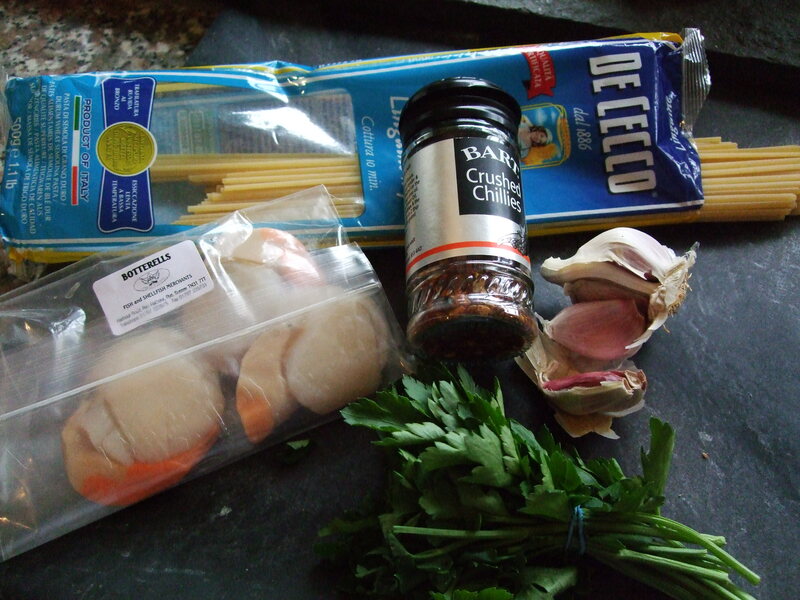 I’m cooking Rye Bay scallops…..
I’ll bought one of the last packs of Rye Bay Scallops at the market this Saturday. Supper last night was this incredibly easy pasta dish, and tonight it’s a risotto. Bring a large pan of water to the boil, add the spaghetti and cook for 10 – 12 minutes until just tender. When the pasta is nearly cooked, heat the oil in a medium frying pan and add the scallops. Cook on a high heat for 2 – minutes until just turning golden, turning to cook both sides. Season and add the garlic, chilli and parsley and cook for a further half a minute. Drain the pasta and toss with the scallops and any oil from the pan. Check seasoning and squeeze over the lemon juice. Serve with a watercress salad and a glass of good white wine, (I recommend Biddenden Vineyard’s wonderful Ortega). Cook’s tip: I sometimes flame the scallops with a tablespoon or two of brandy for an extra hit of flavour if the scallops aren’t quite as good as the ones I bought yesterday. 1 Wash the scallops and pat dry with kitchen paper. Remove the corals and cut them and the scallops in half. Heat half the butter in a small frying pan and cook the scallops very quickly on both sides for a minute or two. Add the brandy and flame with a taper. Let the flames die down then season and set aside. 2 Melt the rest of the butter and oil in a heavy based pan and add the sliced leek. Cook for a few minutes until soft then add the rice. Mix to coat the rice in the butter and cook for a further minute or two. Add the hot stock a ladleful at a time, stirring until each amount is absorbed by the rice keeping the mixture creamy. Keep adding stock and stirring for 15 – 20 minutes until the rice is just tender – ‘al dente’. 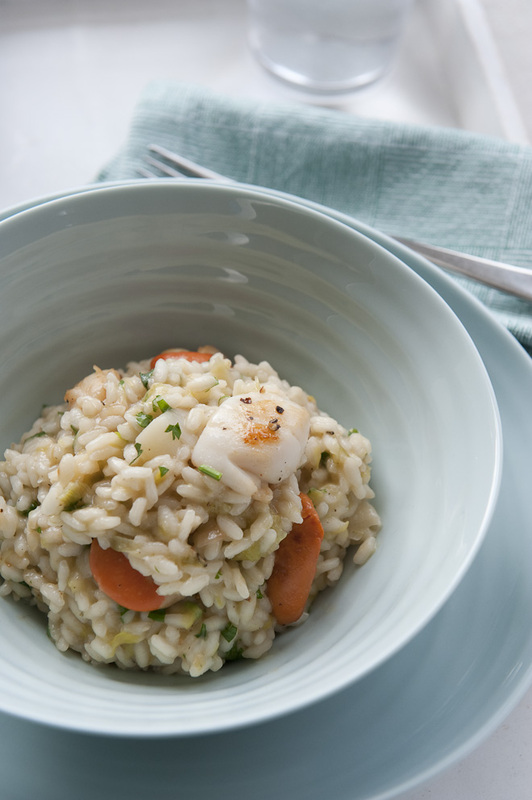 3 Stir the scallops with their juices, the parsley and lemon juice into the rice. Cook together for a few more minutes until the grains are creamy and soft. Leave to stand for a couple of minutes. Serve on warmed serving plates. 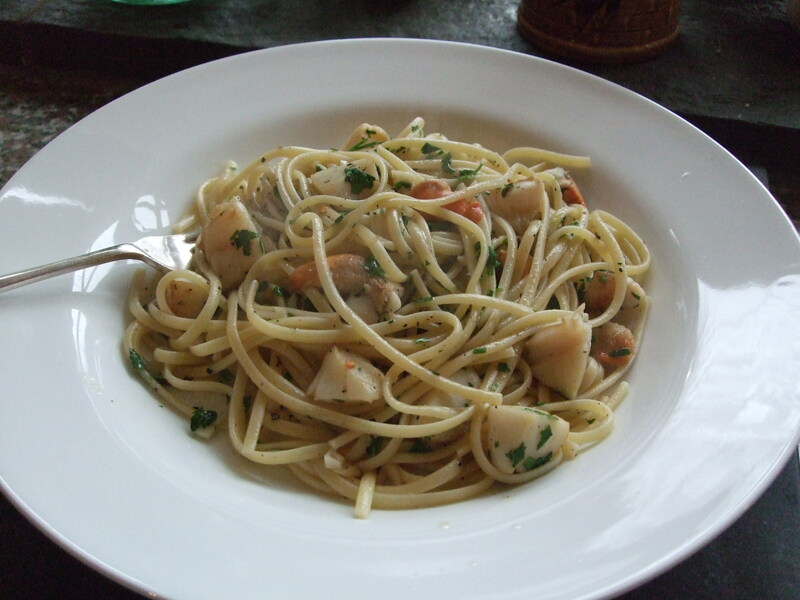 Image | This entry was posted in In season, Recipes and tagged Penshurst, recipes, Scallops. Bookmark the permalink.